What a day - I am knackered (I have a head cold too)!! 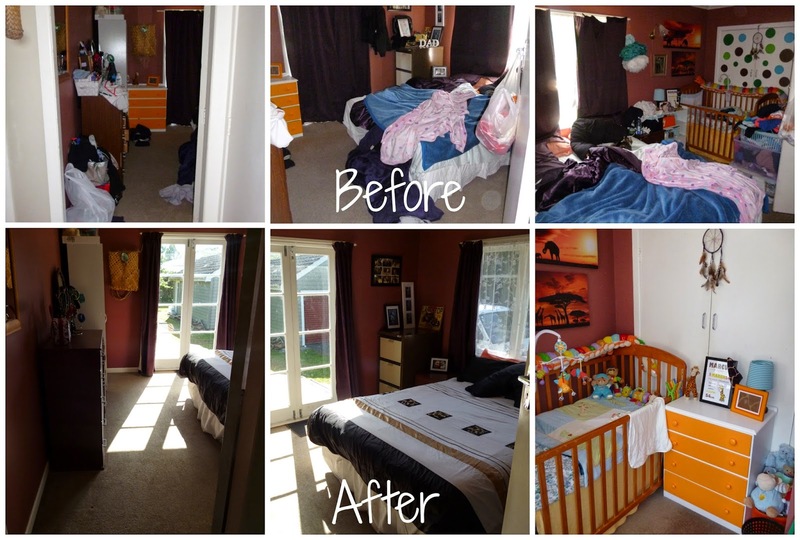 Today I tackled our Main Bedroom - it is my dumping ground, Master M's nursery & "walk in wardrobe" (as I have too many clothes and they just don't make it to the drawers)...this has to be my WORST room in our house! 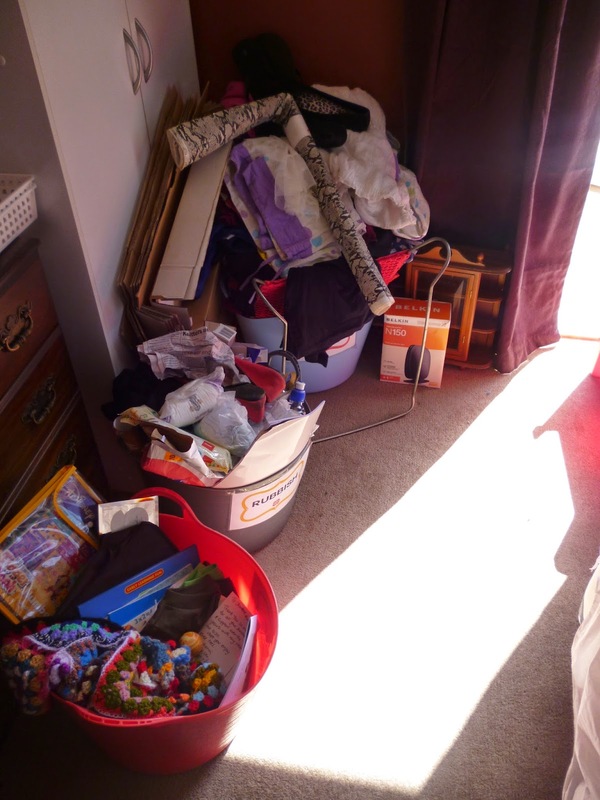 There were quite a few tasks to do in the bedroom...including clean & declutter bedroom surfaces (e.g. dressers). I had my To Do List ready to go and got stuck in! I also had my three bins KEEP / DONATE / RUBBISH ready...they were filling up quite quickly! I stripped the bed - putting all the bedding in the washing machine (thankfully it was a beautiful day for washing) and I put the pillows & duvet inner outside on the deck to get a bit of sun, & put the extra blankets back in the hot water cupboard. Then I de-cluttered Master M's corner, moving the mini bookshelf into Miss B's room (with her permission) and changed the orientation of the cot. Moved M's DIY Giraffe-inspired drawers next to the cot...took the spots off the wall (it did make the corner look cluttered) and bought a funky orange flexi-bin from Mitre 10 to store his soft toys! Master M's area looks so cool! I love it, the splashes of orange and giraffe theme :) I can't wait to set up his room when we move. *Took a break while M settled for his afternoon nap. Once Master M was fast asleep, I took the time to sort through my clothes...I ended up de-cluttering over half of them! I had to be really ruthless! Feels great to be able to put my clothes in the drawers, I also boxed up my favourite winter clothes and shoes/boots. Finished off the task with making our bed (with nice crisp sheets & duvet cover) and vacuuming the room (including under the bed)! Here are the Before / After photos! (I am a little embarrassed about showing you my WORST room)...however, not any more as I am LOVING my new organised & clean bedroom! !